When friends asked us where we were heading to for the Khmer New Year holidays, I had to repeat myself a few times. No. Not the bustling Jakarta, populated by 9.6 million people and a ton of traffic. We were heading to its hipper, artsier, more culturally oriented cousin, Yogyakarta (also affectionately known as Jogja), population 388,627 and located in Central Java. I had long been hearing about it from friends. How calm and peaceful it was. The high concentration of culture and artisanal production in the city and its surroundings. Centuries old temples and volcanoes that had a tendency to rain ash all over its surroundings every so often. I was sold. We needed a longer-than-weekend escape from hot hot Phnom Penh (I don’t know if we’ve yet mentioned that for the past few days, it’s been 45°C or 1000F) and the general bump and grind of life and work in a city that does not hibernate. So off we went, armed with nothing but recommendations from our dear friends who had lived there as natives, visited as children, former students of this college town and this very helpful article from CN Traveler. After an early morning flight (through Kuala Lumpur on Air Asia), we were met at the Dusun Jogja Villa Inn by owner and Jogja native, Amron “Paul” Yuwono, who used to run around the city as a university student with our good friend Stacy. Complete with outdoor showers (where you might enjoy an enchanting late afternoon call to prayer from) and soft mattresses that you just melt into after a long day in transit, Paul runs a great city hideaway with attentive staff and great design. This is in addition to the style services he provides to President Barack Obama’s half-sister, or screening thought provoking (and sometimes banned) films on Saturday nights on the hotel grounds. With Jogja Village Inn located in a tranquil oasis amid the heart of the city, we ventured out to the Kraton – the Sultan’s palace complex. 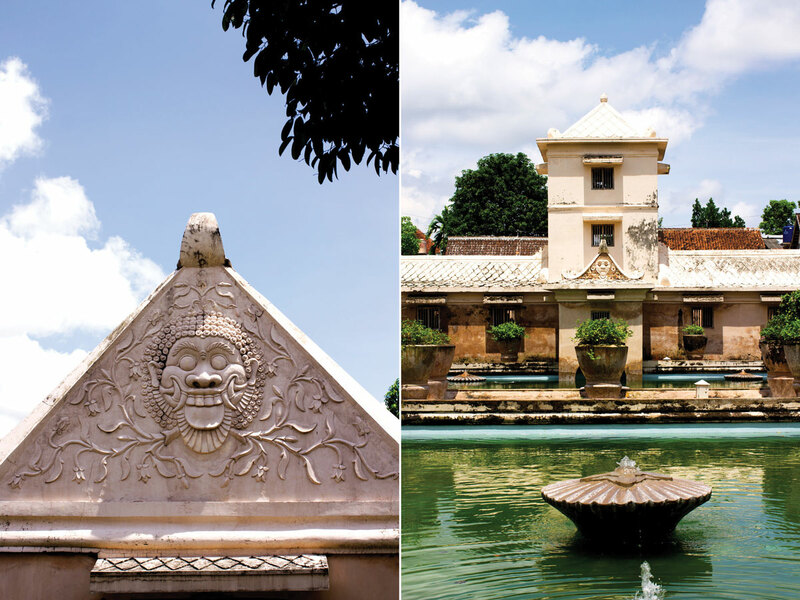 But this area is not just about the majestic and very well maintained palace, where the Sultan still resides and serves as governor of the Yogyakarta Special Region. Surrounding the palace are numerous other royal landmarks from the Water Castle and royal garden known as the Taman Sari, to one of my favourite locations – Sumur Gumuling, the underground mosque. 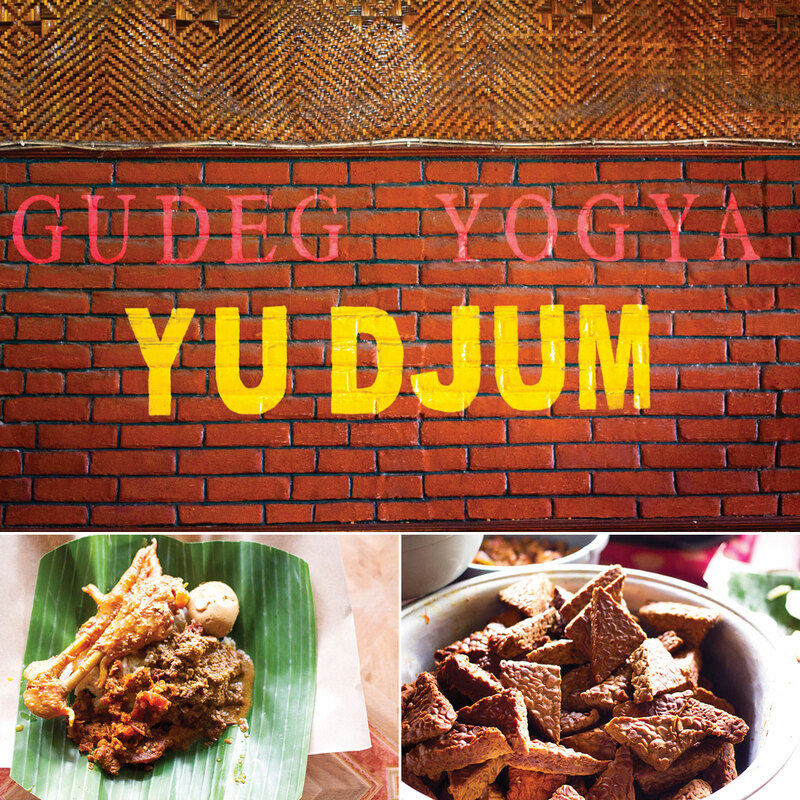 And of course there’s gudeg, the culinary speciality of Jogja. It is ubiquitous and each Jogjan will tell you a different vendor serving the best gudeg in town. We discovered Gudeg Yu Djum was a common favourite serving this very sweet jackfruit curry with rice, egg, tempeh and chicken to locals. I also couldn’t get enough of mie goreng for breakfast. 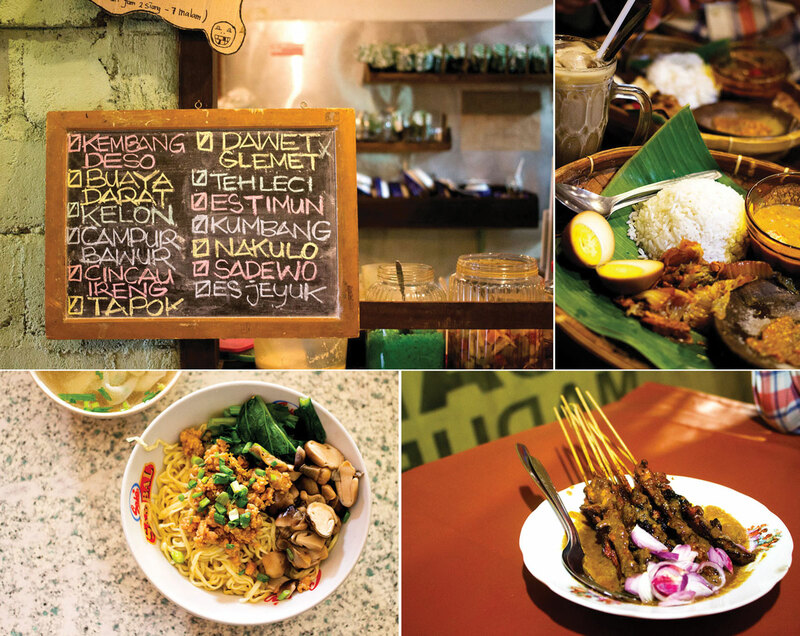 Jogja is not just about its royal landmarks. The areas outside the city are just as majestic. 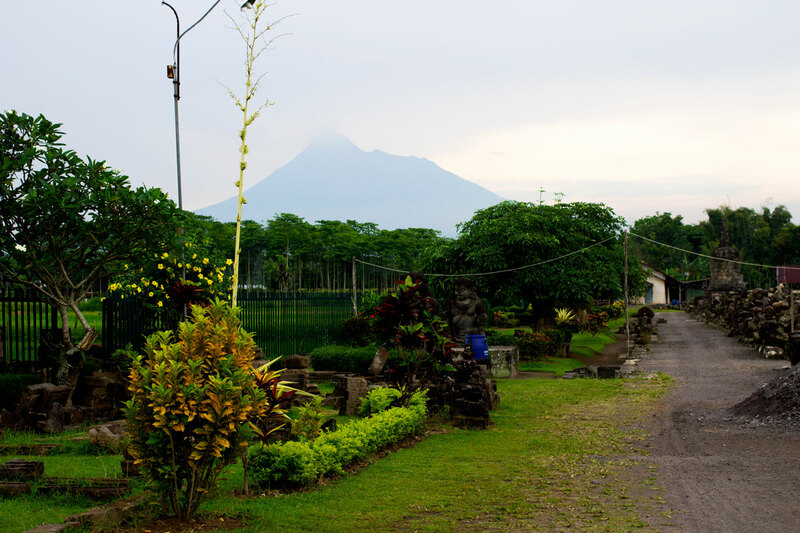 Despite the rainy season, we took a motorbike out (that’s how we role: unprepared) to contemplate the steamy and very much still active Mount Merapi (which eerily looms on a clear day just north of Jogja), and an off-the-beaten path drive through happily irrigated rice paddies to Prambanan Candi, the massive ancient Hindu temples just sitting on the city’s eastern outskirts. And of course, there’s the other white elephant in the room. The temples of Borobodur. Located about 45 minutes northwest of Jogja, and very much manageable as a half day trip, the millennium-old Buddhist temples and World Heritage Site serve as a vast reminder of once great dynasties that ruled Java centuries before traders India arrived. Visitors wind up the ascending levels of Buddhist cosmology before arriving at the highest level of enlightenment at the top of Borobodur’s massive stupa. Each level comes with stories originating from Buddhist mythology carved into the breathing stones that maintain the giant stupa’s structure. Definitely pay for a tour guide (100,000 Indonesian Rupiah, or about 9 USD) to explain each of these stories for you. After a morning that began with a 230am departure for a mountain top sunrise, with the fog rolling in beneath us, and wander through Borobodur, we finally mentally checked into the D’Omah boutique hotel on the southern edge of Jogja in a village (or kampong) called Tembi. And we could n0t have asked for a better way to take the last days of the trip. 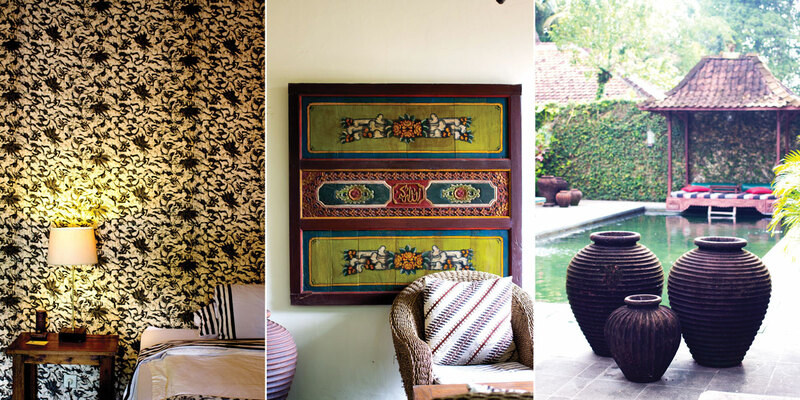 With a room wallpapered with locally-produced batik, and a very well kept grounds that once served as the residence for local leaders of Tembi, we basically just sank into relaxation. Breakfasts facing rice paddies, the sounds of calls to prayer resonating through the air. How could we leave? But we had to. But armed with a good supply of local batik, coklat, and hand carved teak pieces, I knew I just had to share all this. Thanks to Stacy, Irra, Tish and friends for all the great recommendations! 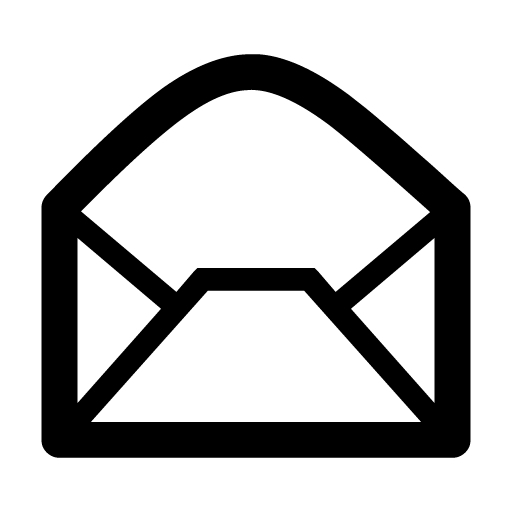 PS – Here are the details! Flights to Yogyakarta are available through Kuala Lumpur (via Air Asia), Singapore (via Silk Air) and Jakarta (on Garuda Airlines). Peak season starts in June through September, when it is relatively dry. The wet season lasts from October until June. Dusun Jogja Village Inn rates range from about 60 USD (Deluxe Room, including breakfast, low-season). 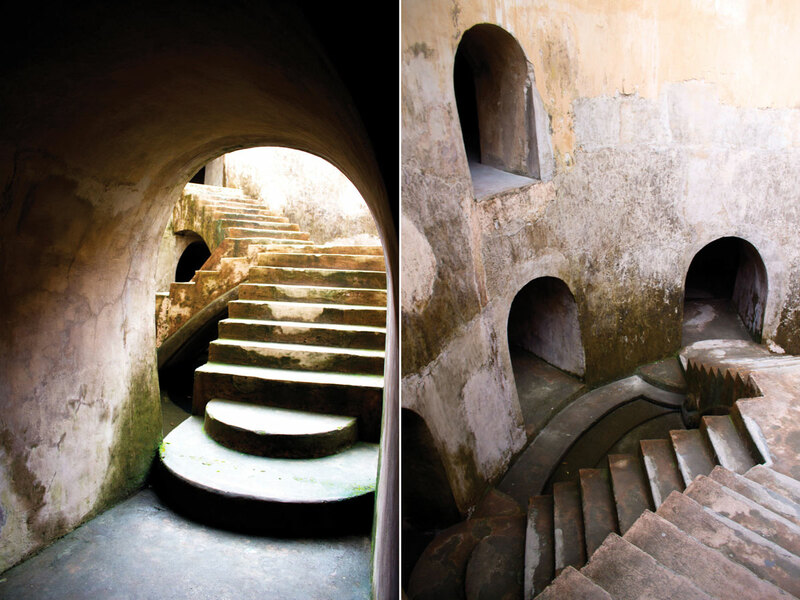 Each room at the D’Omah is unique and housed across four different buildings with an additional private villa also available. Rates range from 60 USD (Deluxe Room, including breakfast, low-season) to 123 USD (private villa, including breakfast, low-season). Scooters are available to rent for about 100,000 Rp per day (about 9 USD) and cars for about 350,000 Rp daily (about 30 USD). Please note that Indonesian roads drive on the left. Beware touts who linger around the temples at the Kraton who will tell you that the temples are closed and will try to take you to purchase batik from overpriced shops. Categories: Asia, goaway, photos by tiff | Tags: CN Traveler, D'Omah, gudeg, Indonesia, Jogja, Jogja Village Inn, travel, Yogyakarta | Permalink. Do you recall where you took the pictures of the school kids sitting on the steps with the kampung in the background – it’s the first photo. It’s just behind the entrance to the complex that houses Sumur Gumuling, the underground mosque! Hope you can find it! If you’re in the area of the Taman Sari, you should be able to find it.